Review: The Big Bang Theory - The Party Game – Bazinga with us! Bazinga on you! The waves again and again pierced on the hull of our little boat. For the second week we cruise the ocean with no hope of rescue. Captain is still looking up in the horizon with hope, ready to give a signal, in case he saw any hint of another vessel. Thus, work remains for the rest of us. There is a total of six of us in here. My name is Sir Stephen and I am the only one from this crew, except the captain, who can write. I decided to create this message in the event, that luck did not smile on us. Our situation is becoming desperate. A week ago, we had plenty food. But now, it’s just us on the boat. And now we have almost no water left.. The captain had just cried loudly, we all ran in hope towards the ship’s hull, nearly knocking over the whole boat. I dipped the paper and ink bleeds from paper on the ground. But perhaps someone can read it. Or maybe there would be no reason for this paper! My hand is shaking with excitement. Lifeboat. That’s the name card game, that tells the story of these castaways, lost and forgotten in the ocean. 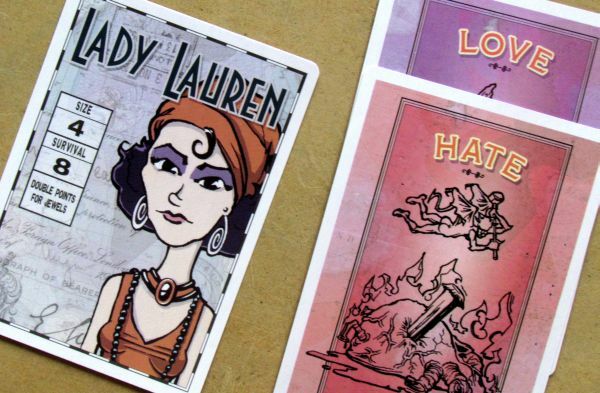 Game for five people, who love and hate each other at the same time. Whole story of the stormy sea and the only surviving boat had only one author: Jeff Siadek, who also published his game with company Gorilla Games. The game was originally published already in 2002, but we received the third, revised edition. This is found in interesting and hard case of small dimensions. It’s actually a box for three card packs together, lying next to each other. But when you open it, you will find, that there are only two piles within. In the middle between them, there are red round tokens of injury and wooden birds. But we should go back to those ninety cards. Their number is good news, although they are divided into many different piles. The base is made of six cards, around which everything will revolve. They introduce you to all the heroes of the story: the captain, first mate, bohemian frenchy, kid, and lady Lauren. And Sir Stephen, hero of our story up there, of course. Their portraits can be found for several times in the game. First with numbers specifying their size and survivor value. The second time, to mark space for each character in the boat. And then twice again. Once to mark somebody, who loves them, but you will be hated by somebody, too.. This gives us together only 24 cards, so now is the time to look at the others. There are 24 navigation cards that will determine conditions of your crew and also your fate in searching for rescue. You can catch a glimpse of the desired gull, but also be introduced to burning sun, where you are overcome by thirst, or even someone from the crew might fall overboard! 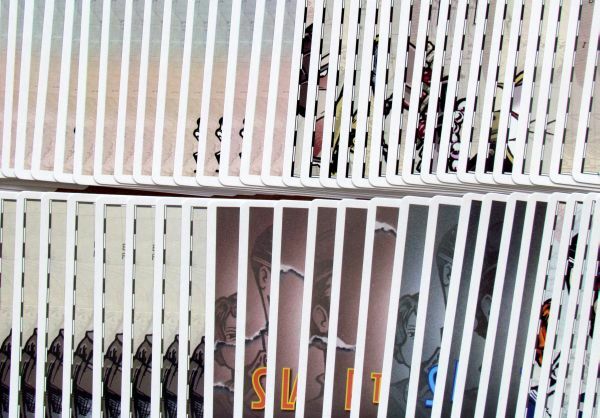 The biggest deck of 42 cards is reserved for provisions, objects you saved from the boat and have them hidden from each other. For your eyes only. At least for now, before someone snatches it from you. Now provisions would be often reason for a big fight among castaways. And that’s the case here too. 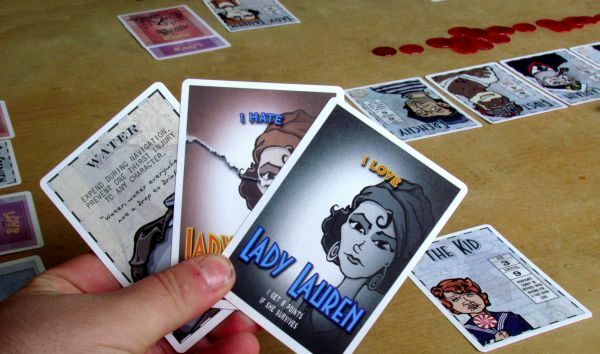 At the beginning of the game players randomly determine, who will take which of the six available roles. It determines your character value for the final score. But equally important are cards of love and hate. 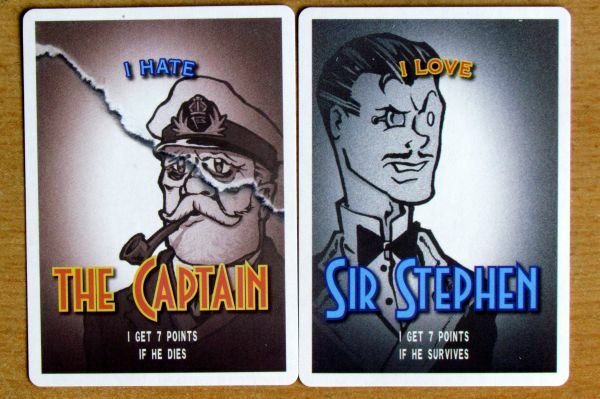 From each of these types, you will also receive one card and clearly determine, who of the castaways loves and hates whom. This information is very important and also provides fun, because you can even love and hate same person or even yourself! Each reveals his chosen identity. In addition to the pair of feeling cards, you still get one random card from shuffled pack of provisions. Rest of this drawing deck creates a supply. In front of this position, all people line up in default positions. 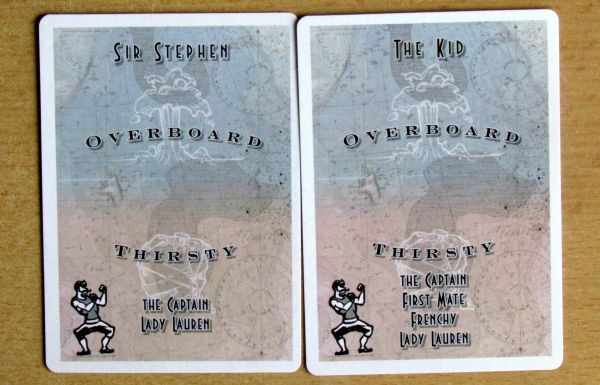 Characters seating is outlined with specific characters cards from starting lady Lauren to last Kid, who has a navigation deck next to him. Here’s tip of the ship, determining your destiny. Position onboar are very important. People can become quartermaster and distribute supplies to others. This character opens each round, by taking as many cards from the provision deck, as there are crew members and chooses to keep one of them. Other are then sent to another player, determined by seating order on the ship, towards the bow. Everyone (except the characters, who are unconscious) divide provision cards. Second and most important phase of turn is moment, when all players get actions after another, always choosing one activity they wish to perform. Then give word to the next player in the sequence, which can paddle, exchange things, rob somebody or take special action, if some provision card in hand allows him to do so. 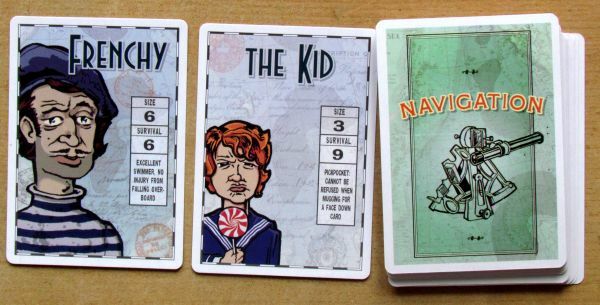 The player, who chooses paddling action, draws two cards from the navigation deck into his hand. One of them will prepare into moving deck and other is put back on bottom of a navigation pile. 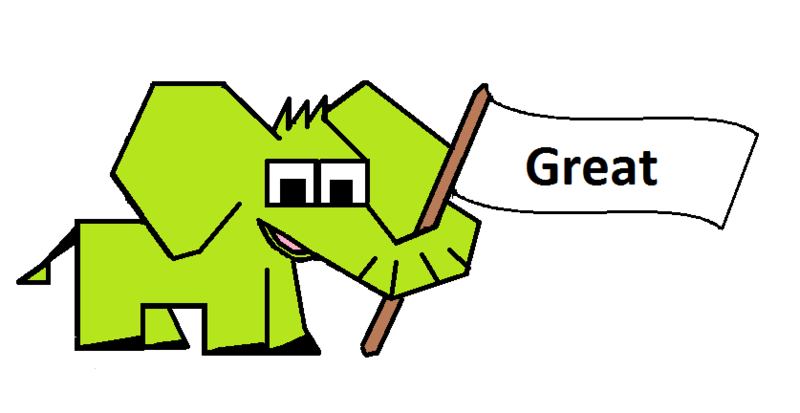 That means, it will come up again after a long time. Your character, however, is exhausted by this effort and can get thirsty at the end of whole turn. 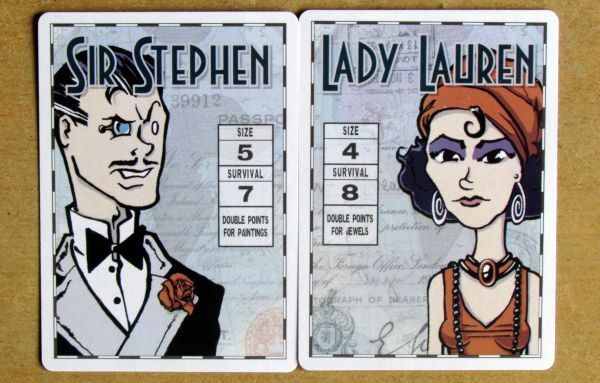 You must note this fact by taking one of the red chips and placing it to the right of your character card. The other two actions are much simpler. Either you simply switch places on the boat with another character, or rob him/her (randomly for one thing out of hand or any played card on the table). Both of these actions require response from the other side. And he can refuse to participate on your decision. At that moment, there is no other solution, than having to figure this dispute with strength. 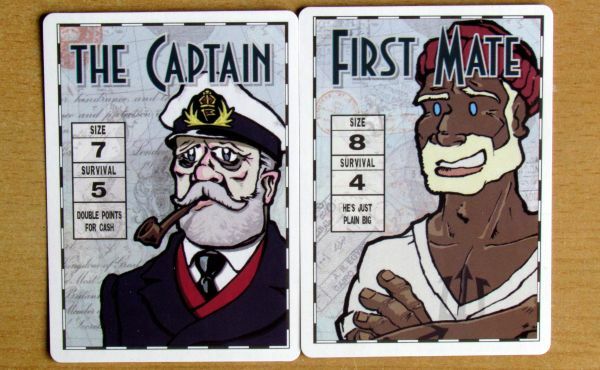 Both sides of the conflict are marked by moving their character cards up (forward) and down (defender) from the alignment line on the ship. Other residents boats may at that moment decide and add their support to any of the parties involved, supporting their favorite. Each participant has possibility to increase his power by playing weapon cards. They must be put face up on the table in front of him, where they remain. This makes it susceptible to theft and lost in the case, player falls overboard. Winner will sum up strength on his side, including allies and weapons. Defenders wins in case of a tie. All losers get one injury in the form of a red chip. 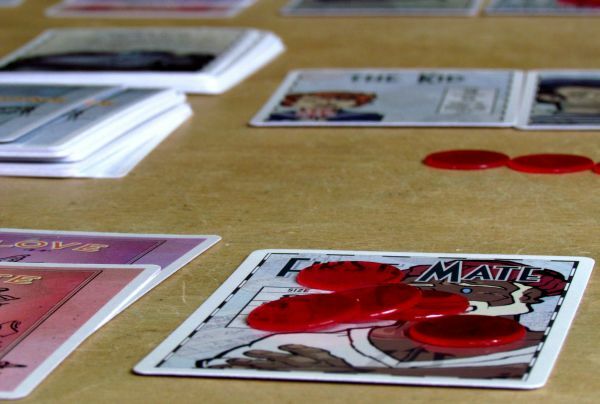 By placing red token on left side of the character card, you again indicate, that you were involved in fight this round. This makes you vulnerable to thirst at the end of the round. Now is the time to decide claims – if attacker gets, what he wanted (replacement or theft). How many injuries you have on your character? Is their sum lesser, than the size of your hero? That is good news. Otherwise you will fall into unconsciousness, where others can rob you without any resistance. Additionally, if you fall overboard, you will face almost certain death. And you can not defend, play cards or draw new ones. If you receive one more injury, you immediately die, but it is actually no different from the unconsciousness. You are still playing, although in a limited way. In fact, only difference is, that you are not counted among the saved, and no one can wake you up from this terrible dream of being stranded on the ship. At the end of the round comes navigation phase. 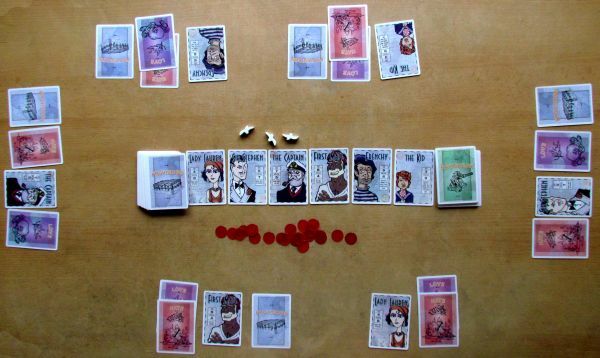 Character seated closest to the front of the boat chooses a card from rowing pile, where they were prepared by others. If there are no card there, you can expect a nasty surprise in the form of drawing top card from navigation deck. Otherwise, responsibility to pick one card remains on the player and read its effect to others. Its text will be performed immediately. There are always waiting for you one of these three options. Best event, anxiously awaited by the survivors is the appearance of a bird on the horizon. All are optimistic, but that does not mean, nothing nasty cannot happen this turn. But before that, you should lay a wooden figure of a seagull in front of bow of the boat, which heralds the approaching land. But hope and joy can prevail only after the discovery of the fourth one, which means land and rescue for all the survivors. But before that happens, you can fall overboard. The card shows you if that happened and to who. That person immediately gets one injury. They can even get attacked by sharks, when they carry some food on them. All the things you have played on the table are immediately lost. Still, you eventually get back on board in time to get thirsty. This is the last third part of the navigation phase. 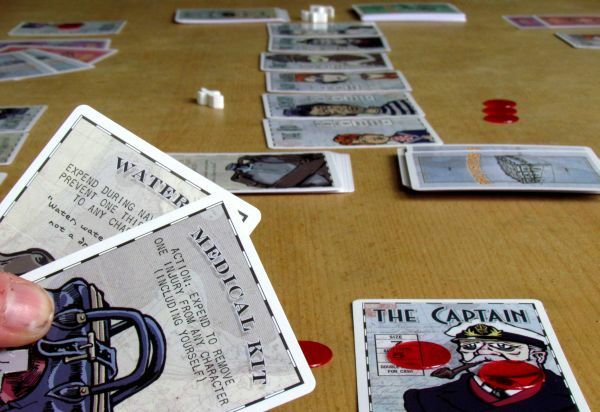 All characters, which have done some activity during this round (rowed or fought) and, moreover, those whose name appears on the card between thirsty (so slackers have not such great advantage over others), have suddenly unbearable dry throat. But only, when thirsty icon appears on navigation card. 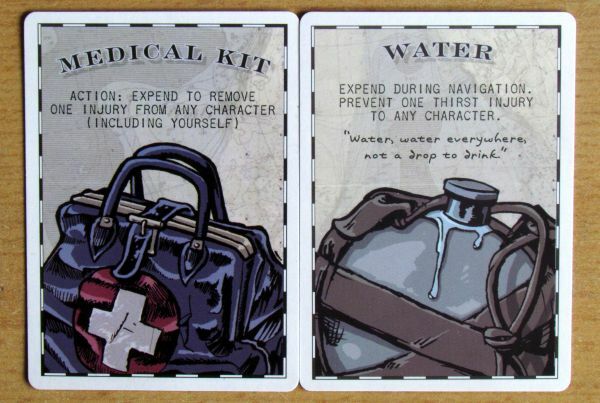 At this point, you have two options – either use a card with water, or get another injury. Now we know, how to play a game of Lifeboat. As soon as the fourth bird arrives, players add up their victory points. And here begins a new level of fun, which steps through the whole game. Simplest are the points for survival of your character. You get its value. In addition, if you are in a boat and not in the water, you also get reward for all things you have with you (cards in hand and on table). But most fun is with beloved and hated persons. For those you get points, if they are alive (beloved) or dead (hated). Together you get the sum, which must be compared with other rivals, and the happiest castaway wins the game! 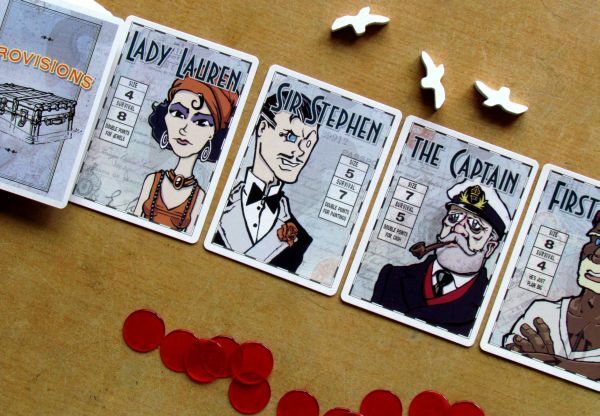 Lifeboat is an elegant and extremely entertaining game, in which players do not spare each other at all. The game mimics battle for survival, in which the priorities are completely different, than in our real life. And believe us, it’s really fun, stuffed with constant squabbling and tension, what fate waits for whom this round. Most interesting are roles of players. 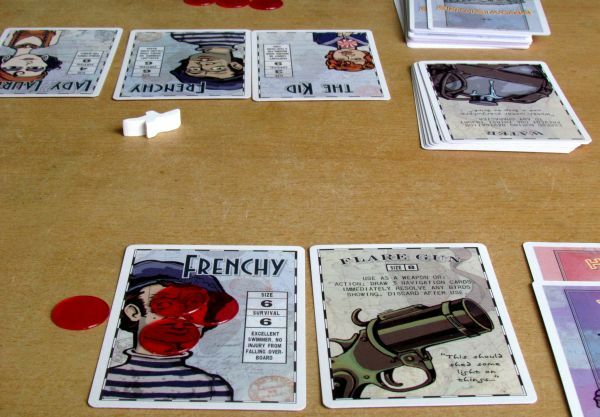 Each character has some advantages (such as French Frenchy can swim well and falling into the water will not hurt him), but have also a different value for survival. Size is then important during fights and when gathering wounds. Players secretly love and hate each other. Character has one person for both these opposite feelings, which perfectly stimulates competition. While one person is trying to discreetly protect somebody, another gets in the way. Provision cards will help you with this, if you draw correct ones to use during the game. But their purpose is sometimes also to protect you in case of emergency, such as water. But bottles to drink are only few, as well as other subjects, so there will not be only arguments for them, but also bloody battle. But you have to consider carefully, because such a situation can lead to thirst. 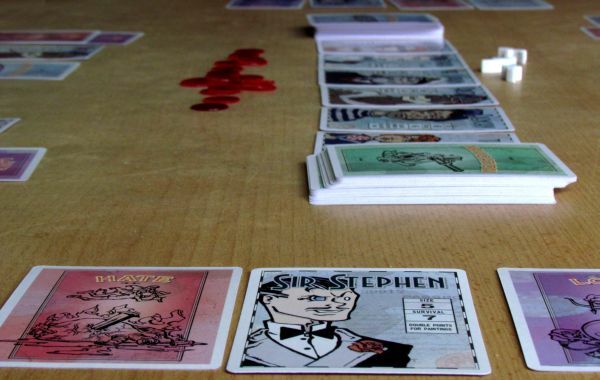 The game provides a number of difficult decisions, that are made during the course. It is completely different every match and not just in your situation, but also in duration before fourth bird is exposed on navigation cards. Entertainment of game increases with number of competitors, who are present on the boat. Therefore, we recommend Lifeboat especially for groups in larger numbers. Its game time stay pretty much the same, although the more players are involved, more actions you have to evaluate. But you also get to see birds sooner. Longest phase of turn is still the same – navigation and its impact. You have tremendous freedom in the game and can do a lot of things. But goal of actions is not only to survive, but also the need to get to supplies or on the contrary to be the navigator. About every position and a bench on a boat is worth fighting for, but at the same time it is not easy to get anywhere, because opponents will resist and disagree. Processing is excellent and funny. To play, you do not need anything more, than is provided in the box. 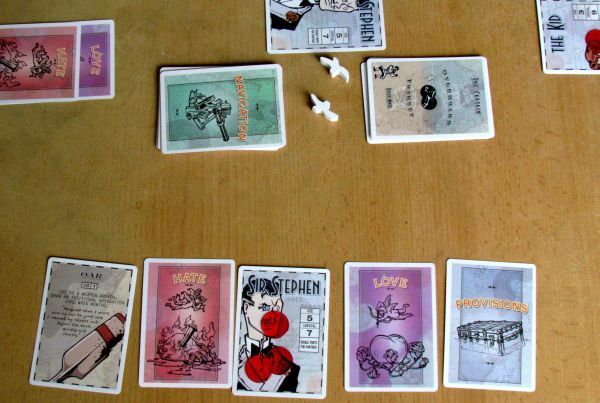 In addition, cards are drawn in an original way, that showcases the game. 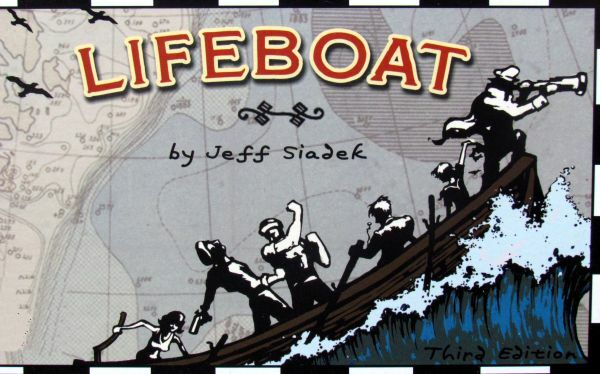 Lifeboat is great fun for all, who like dark humor in a game and also like their uncompromising quest for victory. This time, you will literally walk over corpses and in addition rob them! 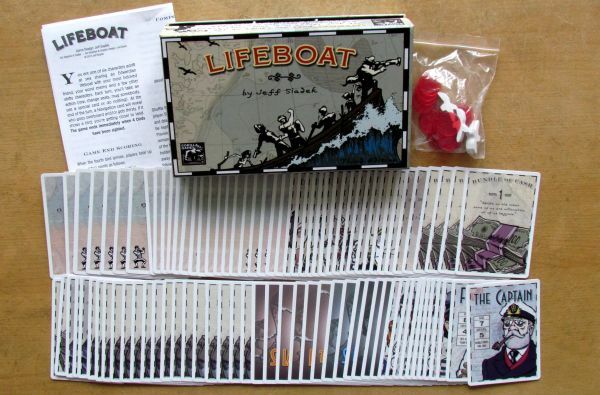 Lifeboat is not a game for the thin-skinned, but for true sailors or those, who would like to try to be a castaway. Game is rough exactly like the sea and it just perfectly suits it. 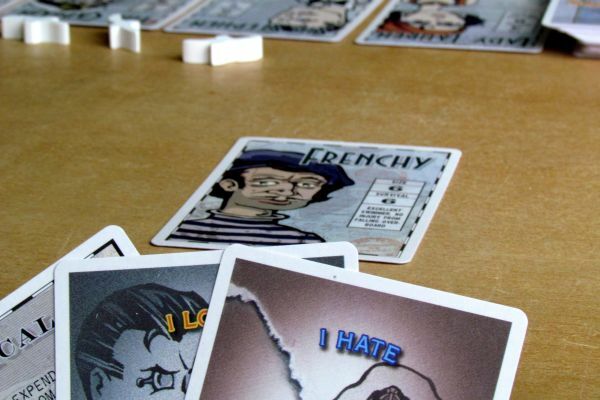 Lifeboat is a card party game, which will not let you breathe easily. You will fight urge to cry for help all the time, while playing the game, because you are stranded on a boat with lunatics. At the same time you love one of your fellow travellers and trying to guarantee its safety and survival. And there is also one person you hate and wish nothing, than death. If you succeed in reaching these goals, you get valuable points in the end, and it does not matter, if you survive on the open sea or not. Players hold secret supplies in their hadns, they can steal or fight for them, which may cause thirst or falling off the ship. It all costs precious life energy, just as paddling bringing you closer to mainland. And when you exhaust your energy, you fall unconscious or die. Whole match has incredible atmosphere and all rivals are in constant conflict for better spots on the boat and above all items. A true paranoia rules your little dry world, like it would happen in reality. Alltogether, Lifeboat is an incredible experience, which cannot even be thoroughly described. 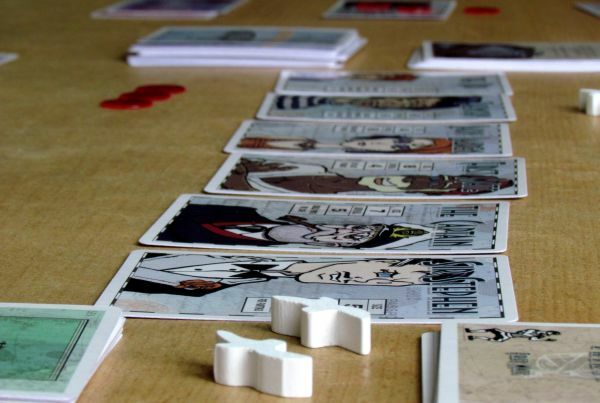 Yes, you can play this game with only four players and up, but you really should gather them around. Time spent as a castaway in a lost boat is unforgettable. Now look for seagulls, because only they are true sign, your suffering is drawing near its end.